Put on your ugliest sweater, sip some hot cocoa or a cocktail, and nosh on yummy food. 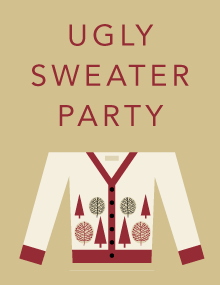 There will be music, shopping, and a prize for the ugliest sweater, so try your hardest to look your worst. We will also be collecting holiday gifts for Mystic Area Shelter & Hospitality (MASH) families at this event. Please bring an unwrapped gift for a child. Hosted by MMoA’s Contemporaries Committee. *Pre-pay has ended. Thank you.